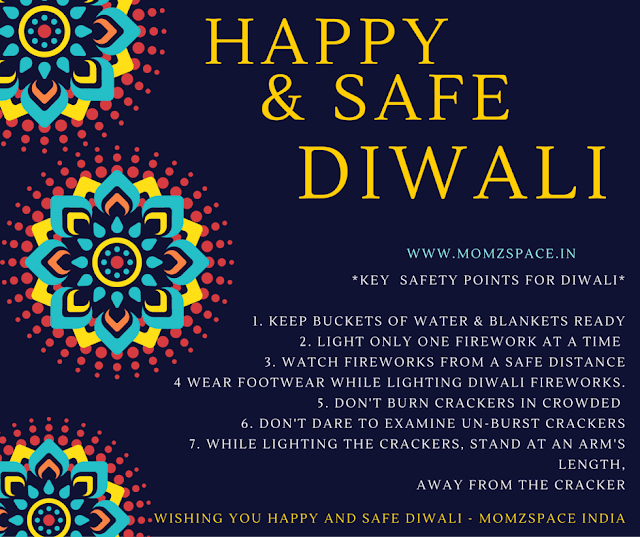 Safety tips and tricks for Kids and Adults while celebrating Diwali with Firecrackers. WEAR FOOTWEAR WHILE LIGHTING FIREWORKS. DON'T BURN CRACKERS IN CROWDED and narrow streets. DON'T DARE TO EXAMINE UN-BURST CRACKERS, if it does not burn , take another one, and info adult about unburst cracker. WHILE LIGHTING THE CRACKERS, STAND AT AN ARM'S LENGTH away from firecracker, no need to peep in while lighting the firecracker. Dont wear falling or silk outfit while bursting cracker as this might lead to an accident. Unapologetic Mother (Working Mom) Blogger!